I think it is safe to say that most everyone who is likely to be reading this article is familiar with the Invasion of Normandy circa WWII. I would also wager that most of you have seen how this was depicted in film – either in something like The Longest Day, or, more recently, Band of Brothers. 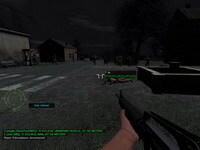 Many of you have played depictions of it in the form of the Call of Duty or Medal of Honor series of games. I have always found that scenario to be particularly compelling – you have groups of people dropped into enemy territory, often scattered and intermingled with other units, lightly armed and typically outnumbered, relying on surprise, speed, and small-unit initiative and leadership to carry out various critical tasks that are essential towards paving the way for a much larger follow-on force, not to mention their very survival. So much of what might otherwise be known in advance in a battle is thrown out the window – you land where the pilot drops you and the wind carries you, which may or may not be where you need to be, or with who you expect to be with. 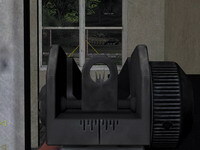 You may drop without complications, or perhaps you’ll lose your weapon or gear on the way down, or some critical piece of gear might be dropped separately and require locating. You form up with who you can find, figure out where you are, and try to make the best of whatever situation you’ve found yourself cast into. It is not an easy job in the best case scenario, and the best case scenario, as we all know, is unlikely to occur to begin with. 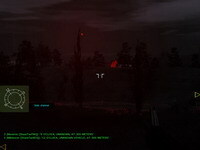 Those concepts are what drove the development of Shack Tactical’s “Airborne Invasion of North Sahrani” multiplayer scenario. We wanted to capture the uncertainty of the drop (where are your squad mates? where did the other squads drop? ), the tension of finding someone to link up with, the tension and fear of moving through a moonlit night with enemies lurking about, the relief of linking up with other surviving paratroopers, and the sense of triumph at accomplishing objectives when the odds are so heavily stacked against you – amongst other things. 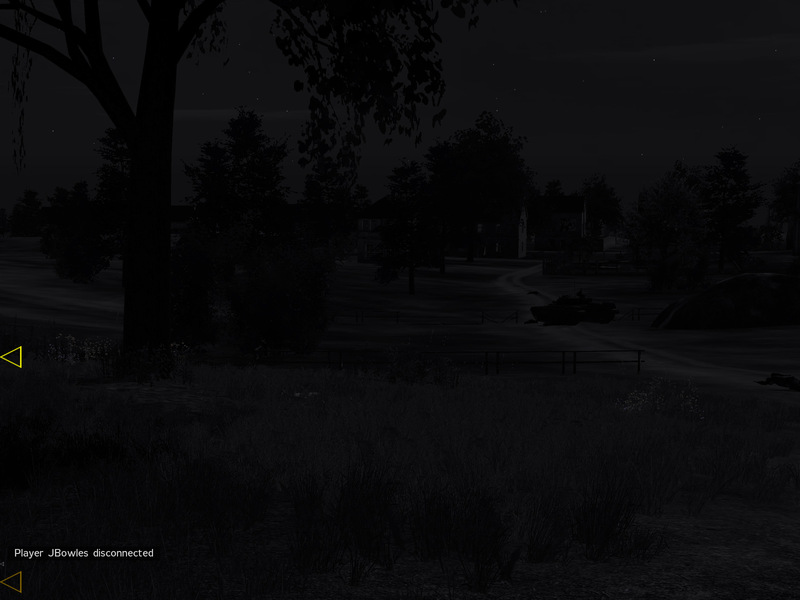 Moreover, we wanted to take advantage of the strengths of ArmA to make it more than a cookie-cutter, every-playthrough-is-the-same experience. 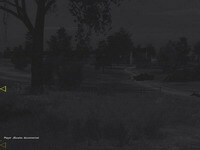 The emphasis was to be on emergent gameplay through and through, where each playthrough could turn out dramatically different based merely on where you happened to land, what objectives were nearby, and who might have landed close to you. Having played this a few times now, I can say with pride and certainty that we have accomplished that – no two playthroughs from my point of view have been the same, and I could just as easily have written this AAR based on any number of them. 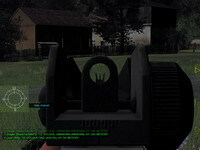 There are several features of ArmA that contributed towards this mission being possible. The most important, of course, is the game’s excellent voice-over-net features (which this mission acted as a testing ground for). 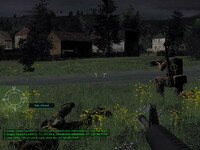 The mission was played with no Teamspeak usage, and no radio-based communications – all conversation was done via the “Direct Speaking” 3D locational audio system built into the game. As you will soon read/see, this added immensely to the immersion of being alone in the dark North Sahrani countryside, searching for fellow paratroopers to form up with. 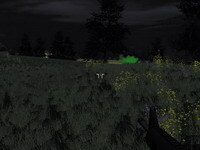 The other features are staples of ArmA – the sheer size of the environment (this mission took place in an area that was about 16 square kilometers in total) , the excellent modeling of nighttime visibility, the fantastic scripting options available for mission design, and so on and so forth. Lastly, a few words about what this AAR contains. I have always believed in telling a story as true to how it happened as possible. There is nothing in here that isn’t based on the facts of what occurred in the mission. The narrative’s sole intent is to convey the experience of the game, and every little detail is drawn directly from the mission itself without embellishment. It has long been a pet peeve of mine when people “pretty up” a gaming story with things that did not happen, or details that are not modeled or possible. 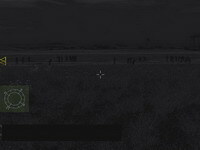 This AAR is devoid of that – what you read is what happened, and there is enough footage of the mission presented within to confirm that for yourself. Before we begin, one note about the screens – I have brightened the thumbnails of many of the screens, while the full-sized images are that their normal brightness level. Additionally, I would highly recommend watching the videos in fullscreen for maximum effect. The mission from my POV lasted about 50 minutes – the video snippets shown here capture about 20 minutes of it. I’ll have a full video posted in the future for those interested – check back in a few days.  I had a great time both playing the mission and creating this AAR. I hope you all enjoy reading it. Credit for the mission creation and scripting goes to ShackTac’er kevb0, with the concept and ideas having been brainstormed between him and me. The invasion of North Sahrani was set to be preceded by a surprise airborne assault. 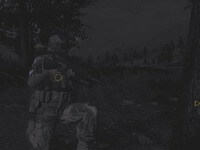 For this operation, one platoon of ShackTac personnel was to be dropped via several transport aircraft in the dead of the night – our mission was aimed at taking key positions, destroying various enemy assets, mining roads, searching for enemy intel, and generally causing havoc behind their lines. Once on the ground, our squads would be expected to move out to the objectives given in our briefings and methodically knock them out one after another. If successful, we would then dig in and await relief from the South Sahrani Army units assaulting via land through the city of Corazol further south. 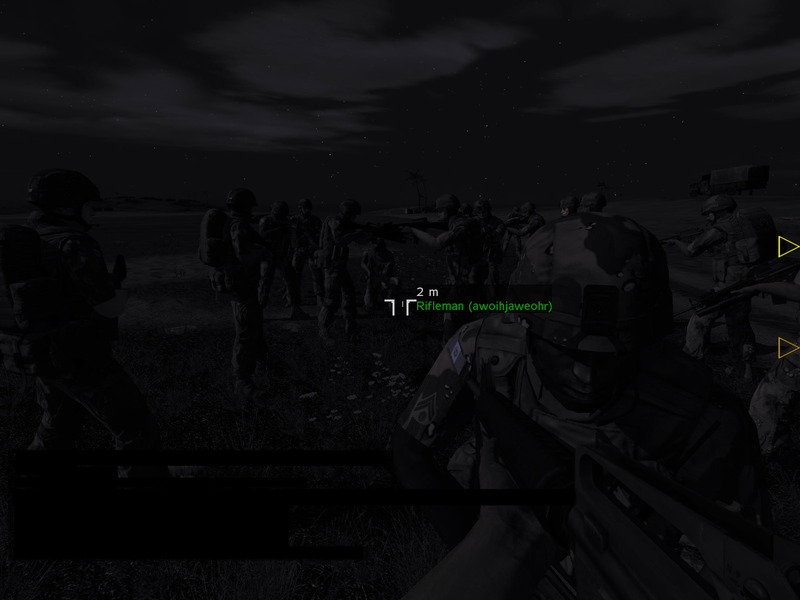 Our platoon numbered around 50 strong at this point, all of them being real human players. There were several significant things to be said about what we would experience once on the ground. 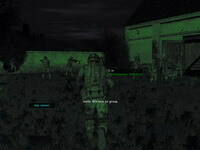 The mission was designed around the concept that the South Sahrani forces were not terribly experienced or high-tech – both of which seem to be backed up by the original ArmA storyline. We used this to introduce several compelling gameplay features. The most significant, as mentioned previously, was the lack of any radio comms. All speaking would be done verbally, based on proximity to others. We would rely on colored flares for coordination – a red flare would signify a request for help, green was a “Rally to this position” mark, while yellow was reserved to signal that an objective had been completed. White flares were issued as well, for the purposes of straightforward illumination. Special scripting in the mission made the flares a double-edged sword – while they would signal friendly paratroopers, they also would alert nearby enemy patrols, who would then move towards the source of the flare to investigate things. Thus, their use had to be carefully measured by those so equipped. In addition to that, all groups would be dissolved once exit from the plane was made – thus, the difficulty of linking up was increased. Once two players met, they could form an impromptu group, but until then they were on their own, with no leader mark to guide to. Finally, only a select few leaders (typically fireteam and squad leaders) would have maps – for others to view a map they would have to be within 3 meters of a map-holding person, and they’d only be able to look at it briefly, while staying that close to the mapholder. 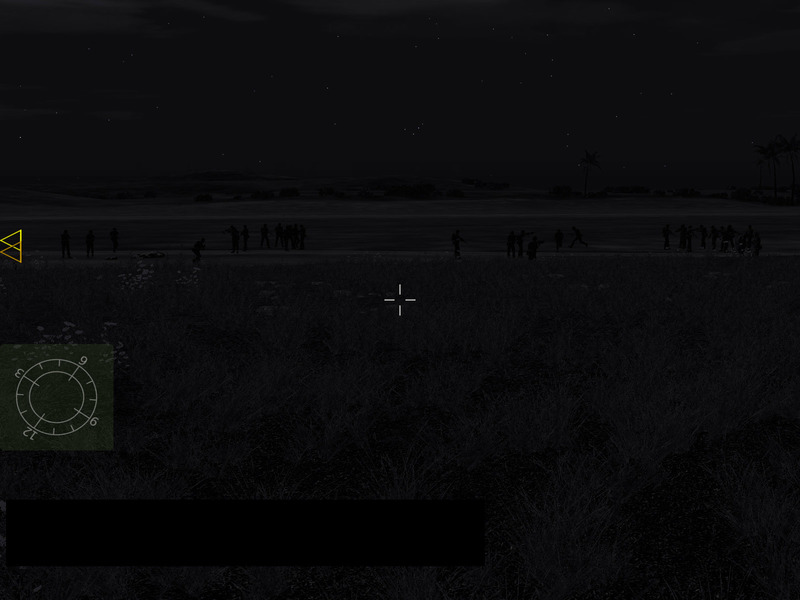 Our pathfinders, deployed covertly into the drop zone areas earlier in the evening, had passed along intel indicating that the area was infact held by at least two companies of motorized SLA forces. There were indications of an enemy T-72 roaming the area as well, and Shilka AAA batteries were known to be present. With all of this in mind, our squads assembled on the runway, ready to take off into the unknown. People talked back and forth over direct speaking, giving last minute advice to the newer players, rehashing rally points, and generally preparing themselves for the fight ahead. In short order we were loaded up into planes and began the flight to the drop zones. We sat in the planes on the way to the DZ, chatting back and forth over the roar of the engine. People took the opportunity to square away their loadouts – the plane was packing some extra gear, and we took a moment to swap out a magazine for a flare, or a bandage, as appropriate. Seeing as how I was a medic, I opted to ditch a few magazines so that I could carry extra bandages. I also packed a few extra flares for good measure – never knew when you might need them. Our plane, carrying Alpha Squad, was set to hit the DZ first. We flew for a bit when suddenly the call came out – “FIFTEEN SECONDS TILL WE HIT THE DROP POINT! GET READY!”. It was time. 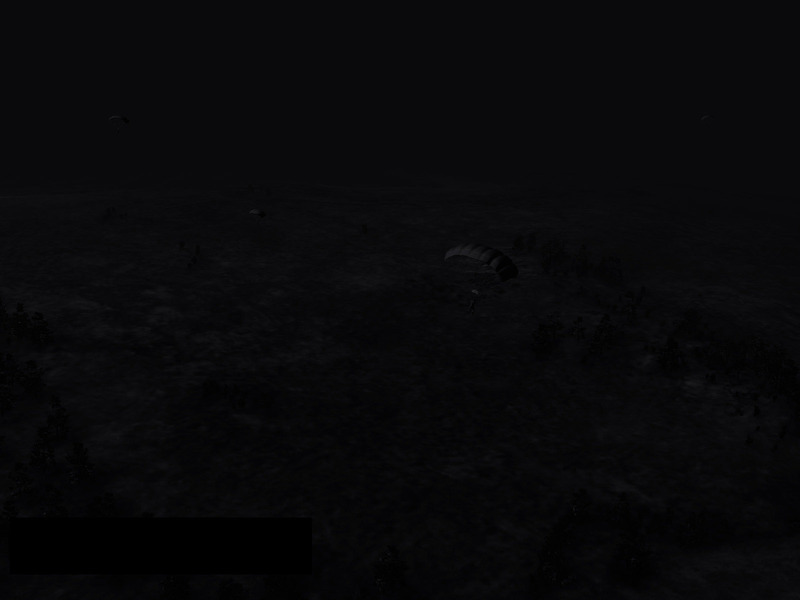 One after another the Alpha Squad paratroopers dove out into the darkness. I was the sixth man back. The next thing I knew I was floating hundreds of meters above our drop zone, hanging from a chute harness above a moonlit landscape. There was a muffled thump of an explosion in the direction our plane was flying – the SLA forces below were putting light anti-aircraft artillery fire towards it. Apparently we had indeed caught them by surprise. Hopefully the follow-on planes would be as lucky. 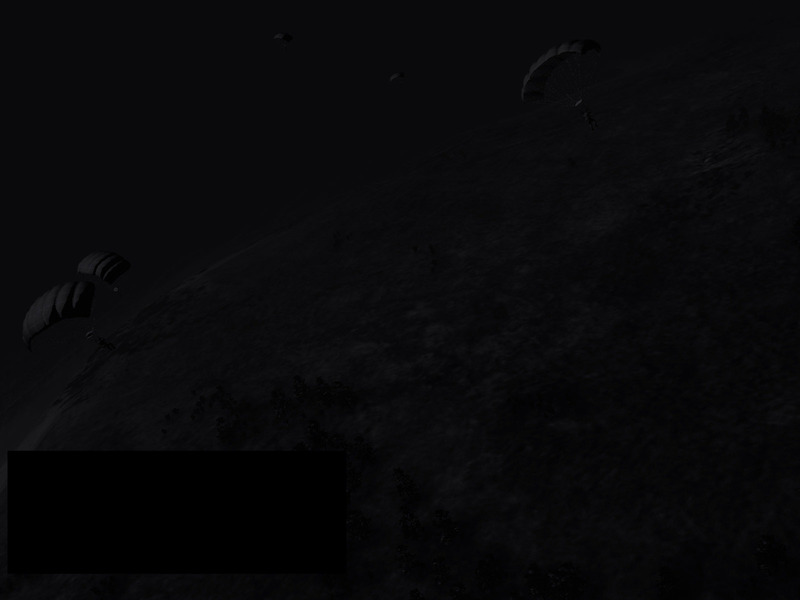 To my left I could see several Alpha Squad members in their chutes, floating down a few hundred meters to my west. To my right I saw nothing – the rest of Alpha, if it was there, was either above me or far enough behind me that I couldn’t see them. The thump of a cannon went off sporadically as I fell. Below there was little to see – we seemed to have been dropped over fields, which would hopefully help with our reforming. I strained against the darkness to see anything below me – enemy infantry, vehicles, structures, anything that I needed to be aware of before hitting the ground. To my right I could see a small village with two T-junctions – I recognized it from the briefing as a position we would need to move to and hold for a period of time to cut off SLA reinforcements coming from further inland. Perhaps that would be our first objective once Alpha had formed back up. The wind was pulling our stick apart – two people were now drifting to my front-left, with another roughly to my front, and two more hundreds of meters further past. Down and down we fell, ever so slowly, ever so vulnerable. The planes had made their drops from a bit higher than usual due to expected enemy AA capabilities, and it was proving to be stressful on the nerves. 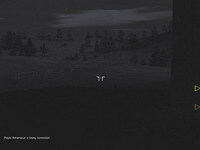 Two hundred meters… one hundred… the sounds of the night below slowly came into focus. One paratrooper to my front touched down – the last thing I saw before hitting the ground was their chute collapsing to the ground. And then, without ceremony, I had landed. I found myself in a field next to a small, rough-hewn fence enclosing yet another field. A few buildings were visible dimly in the distance behind me. I looked around, got my bearings, and heard the moaning of a wounded paratrooper. I ran along the fenceline, looking for an opening. Finding one, I darted through and raced towards the sound of the wounded paratrooper. Explosions crashed in the distance – in between them the drone another plane approaching could be heard. Bravo squad was about to be committed to the fight. 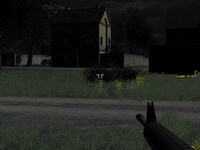 I ran towards the small cluster of buildings where the wounded man was. Quiet voices could be heard ahead – para voices. 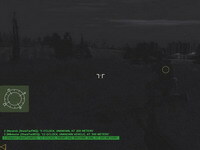 A Shilka let loose a burst of green tracers from beyond the buildings, spraying the cannon fire wildly into the air towards the Bravo plane. Near the buildings stood a figure – I called out to them as I ran, identifying myself as a friendly, and in short order I had linked up with Milkduster. A few moments of conversation with him were followed by the requisite medical attention – he had been banged up on the drop and needed a bit of aid. As we got him squared away, another paratrooper came running up, sans weapon. It was Maverick, and his weapon had been ripped off his gear when he jumped from our plane. There wasn’t anything we could do about it at that point, so he simply stuck close and waited for an opportunity to acquire a new weapon. As we contemplated where to move, Bravo squad chutes drifted down, silhouetted against a gray sky. They slashed across our position and off into the distance, most of them seeming to be landing closer to Modesta to our east. The Shilka continued to fire the occasional bursts towards the sky, fortuitously ignoring the paratroopers themselves and focus more on shooting down our planes. 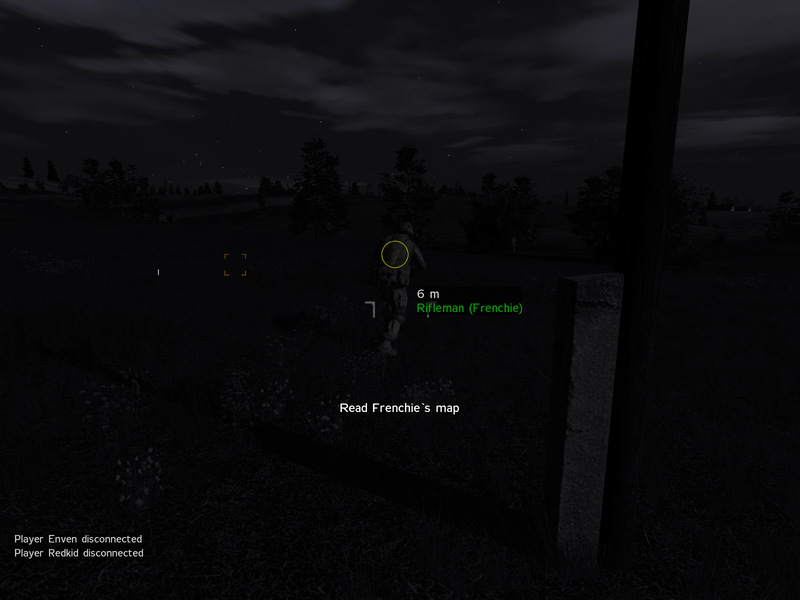 Milkduster called out a parachute to our south – it turned out to be Frenchie, Bravo squad leader. He landed almost on top of us. Milkduster ran out of the small village to link up with him and bring him back to us, putting our little impromptu band at fireteam strength. According to him, he had fallen far from his squad – seemingly the same situation that we had found ourselves in with relation to Alpha. A green flare sprung into the sky to our north right as the Charlie plane came roaring across the sky. More explosions erupted in the sky as the AA turned its attention to Charlie’s plane. Alpha was trying to rally, but we were nearly a kilometer away from the rally point, with the Bravo squad leader, an unarmed paratrooper, a medic, and one other armed trooper. We hunkered down amidst some hay bales and contemplated our options. We couldn’t link up with Alpha, they were too far. We’d have to move to the closest objective and see what we found there. Mindful that one of our members was unarmed, a look towards Frenchie’s map was made for the possible locations of the supply bundles that had been dropped with each squad. The closest one was almost a kilometer away to our north, which would have put it right where Alpha seemed to be rallying. Once again, it was simply too far to travel in our current state. Frenchie, ranking member of our group, took command. He had us moving out towards the double T-junction at the small village I had seen while falling earlier. It was the closest objective to our position, and there was good chance that other friendly forces would be heading to it as well. Milkduster ran point, with Frenchie trailing behind him, me behind Frenchie, and our unarmed Maverick as our rear “security”. 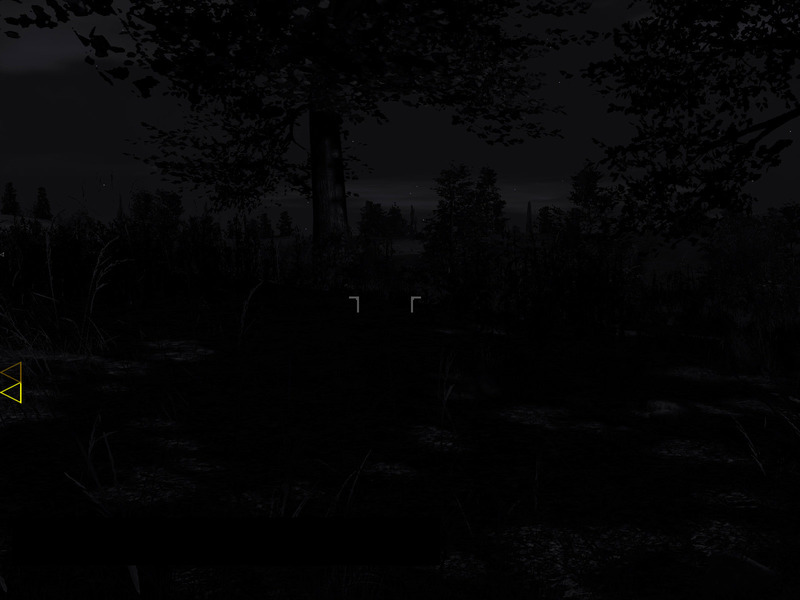 We moved cautiously along a dirt road, struggling to see any threats in the moonlight. Off to our east the sounds of small-arms fire could be heard – Bravo, perhaps, fighting around Modesta? The fourth and final plane, carrying the Platoon Headquarters element, made its approach. I stopped and turned my eyes to the sky as the AA explosions began anew. I could see nothing – no plane, no chutes. The clouds slipped in front of the moon as we jogged onward to our objective. Green tracers continued to zip across the sky, probing at things we couldn’t see. As we came into view of the T-junction and village we needed to hold, doubts rose. Frenchie wasn’t sure if we could hold it ourselves – three riflemen versus who knew what might come to oppose us. While I was just the medic, I tended to agree with that assessment. Better to let another, larger element take care of the T-junction. We needed to link up with another group before worrying too much about being heroes. A flare popped up to our northwest – a white one. 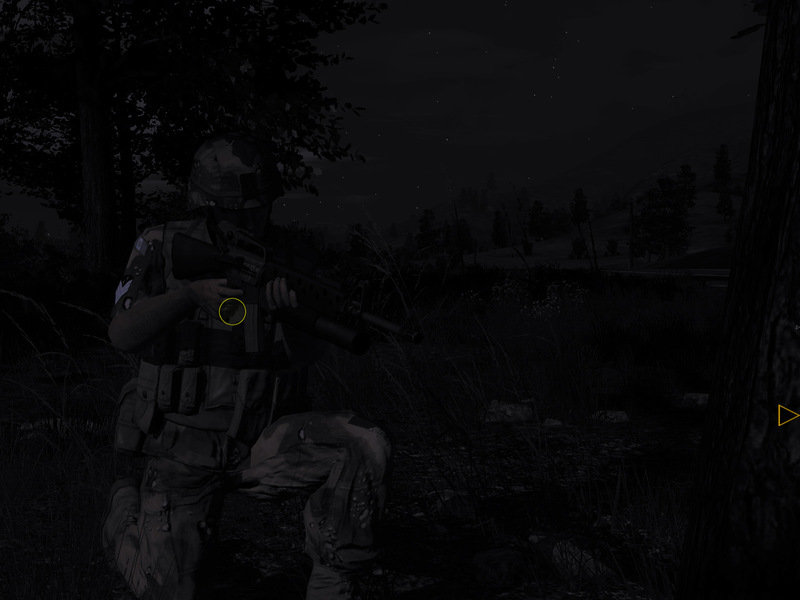 Frenchie took a knee and pulled out his binos, scanning for whatever might have sent it up. Enemy infantry! It was a squad, moving at a jog towards where we had been minutes earlier. If we had moved out towards the green flare, we would have run smack-dab into them. It was only by virtue of following a road that curved away to the east that we hadn’t run into them. Discretion was the better part of valor. We held fire and snuck off. In the distance, in the direction of Modesta, another wounded paratrooper could be heard crying out in pain. As a medic, I wanted to get over to them and take care of it – we had no guarantee that the Bravo medic had regrouped with whoever was fighting Modesta. Frenchie led us off, across the dirt road and into a forest, and the T-junction was left for some other, beefier, group to worry about. Explosions and gunfire sounded in Modesta as we jogged towards it through the shadowy forest. As we neared the edge of the forest, a red flare burst into the sky over Modesta. Shilka fire to the north. Small-arms to the east. 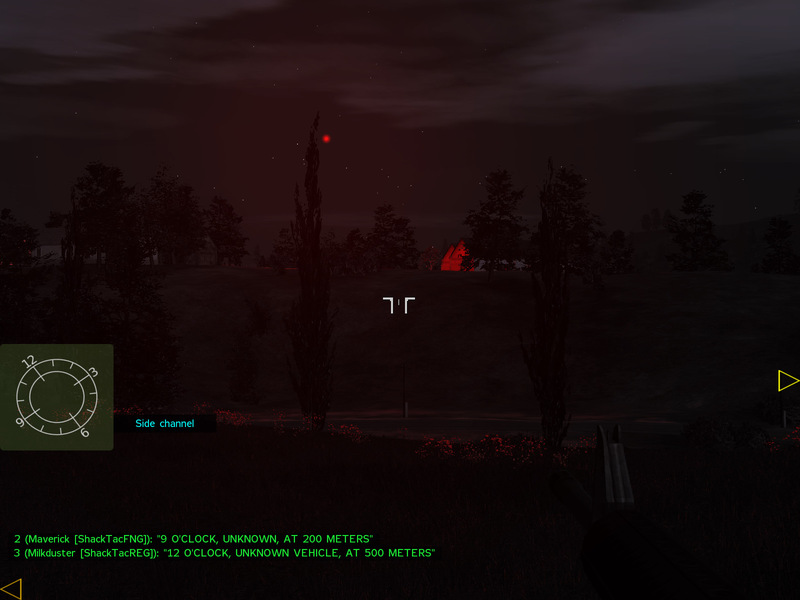 More shilka fire to the south. Things were definitely heating up. We took a knee at the edge of the forest and discussed what was happening. The cries of the wounded man were silent now – whether he was dead or had been tended to was unknown. The firefight in Modesta was still full-on – we could hear a vehicle, rapid exchanges of gunfire, and the thumping of explosions still. Really, though, the red flare said it all – someone needed help, and we could help. Frenchie ordered us across a paved road near the forest and towards the hill that was presently blocking our view of the town proper. We ran at full tilt, weighing the potential urgency that the red flare signified against the possibility of enemy contacts on the way there. I scanned hastily to our sides as we went, straining to see any movement in the fields around us. The Shilka to our south was now firing directly over us – the rounds were cutting through the air several dozen meters above our heads. Milkduster called out to any friendlies who might be atop the hill – no reply was received, and we moved up into sight of the town. The chaotic sounds of battle were silent. A white flare drifted lazily down towards the town. For a moment, it seemed like we had missed the fighting. 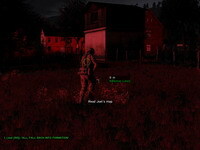 The area was suddenly cast in a red light – another red flare had popped up, south of the town in a small compound. Frenchie called it – we would be moving to that compound under the assumption that friendly forces had holed up in it. As we started towards it, a tremendous crashing explosion sounded in the distance. 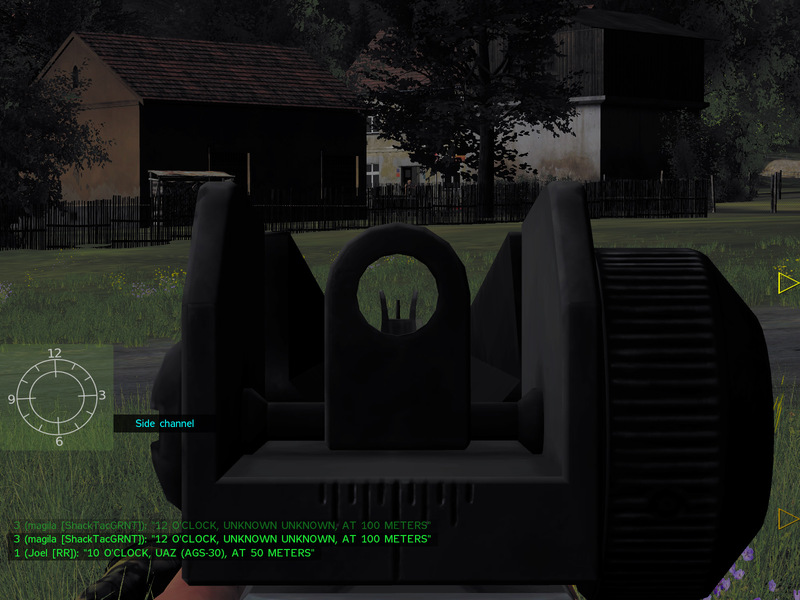 One of our platoon’s objectives in that direction was an enemy fuel station. The explosion must have been from a team rigging it with satchel charges. Another rapid exchange of gunfire came from Modesta. 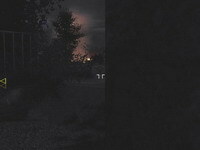 If there was a friendly presence in this town, it was likely spread out – one flare had popped over the town itself earlier, and one had popped above the compound we were running towards. As we crested the final rise before the compound, a white flare popped into the sky. In its light we could see a billowing cloud of green smoke outside of the compound – a clear indication that friendly forces were inside. We ran the last two hundred meters to the compound, calling out loudly that we were friendlies as we came up to and then entered the buildings. Another crashing explosion came from behind us – what it may have been, I had no idea. It certainly wasn’t good news for the SLA. To our great relief, the compound was full of friendlies. One paratrooper was rigging satchel charges around a set of ammo-bearing Ural trucks as we entered, the rest were scattered around, defending the position or discussing what to do next. 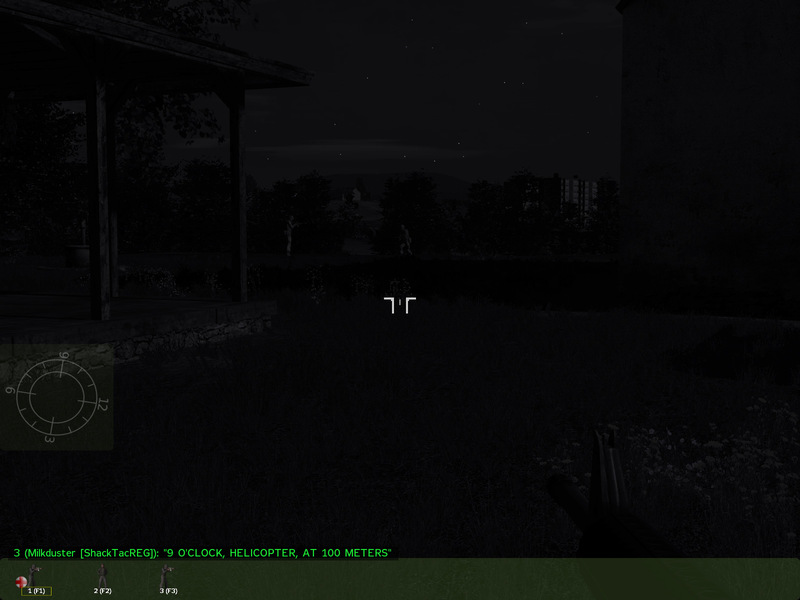 A green flare was sent up above us in an attempt to rally more paras. Continued firing in Modesta indicated that there was indeed another group of troopers in there. Maverick, formerly weaponless, now found himself equipped with a weapon. Frenchie and Joel, senior members of the assembled group, split everyone up into two teams. I found myself attached to Joel’s team, since Frenchie’s medic, Snow, was in the compound. A green flare popped above Modesta as we finalized the team assignments. A few moments later, a red flare replaced it. It was time to go. Our fellow paras in Modesta needed help, and we were in position to supply it. We made it across the field to Modesta without incident. Immediately upon hitting the outskirts of town we were in the fight. The first batch of hostiles was dispatched handily. Further in town we could see friendly forces moving in and around a structure they were using as a fighting position. 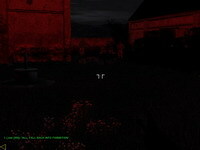 We continued deeper into the town under red flarelight. Trooper Paul appeared at a corner in front of us and contact between our two groups was made. Meanwhile, Frenchie’s element was moving back the way we had come earlier, intending to take and hold the T-junction we had been unable to take previously. Combined, the Modesta forces equaled about ten to twelve paratroopers. Madcows was in charge of the other group, Joel in charge of ours. The two ducked into cover and discussed the situation as the rest of us provided security. A white flare, likely popped by enemy forces, lit the town. 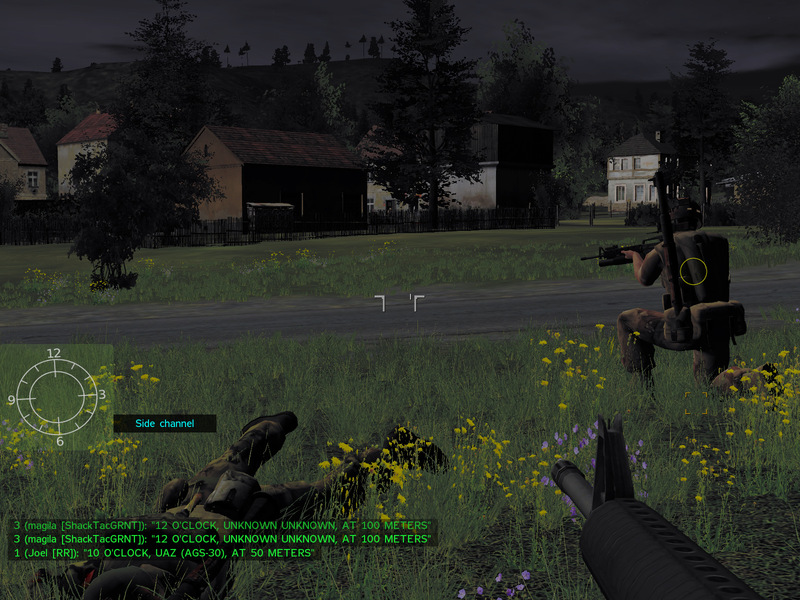 Two UAZs were stopped on the road a bit away, their crews lying dead on the ground around them. A few scattered SLA bodies littered the streets in town. Things seemed to be under control. “WHOA, we’ve got infantry!”. The shout was followed by a volley of fire, and then, with impeccable timing, the explosives placed with the trucks back at the compound we had vacated went off. There was a moment where it seemed like all hell was about to break loose. 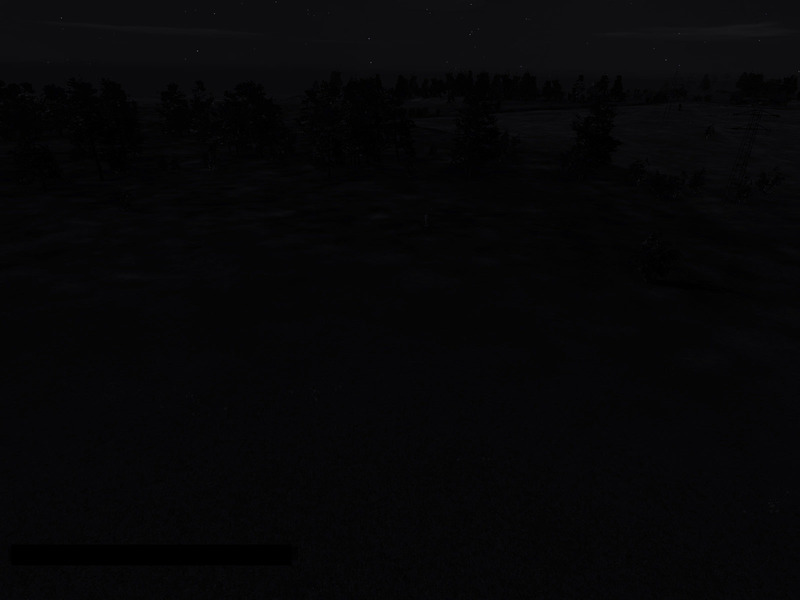 A T-72 was spotted coming from the east – Madcows rushed around to his squadmates, calling for anyone with an anti-tank weapon to get to the east side of town to repel the tank. 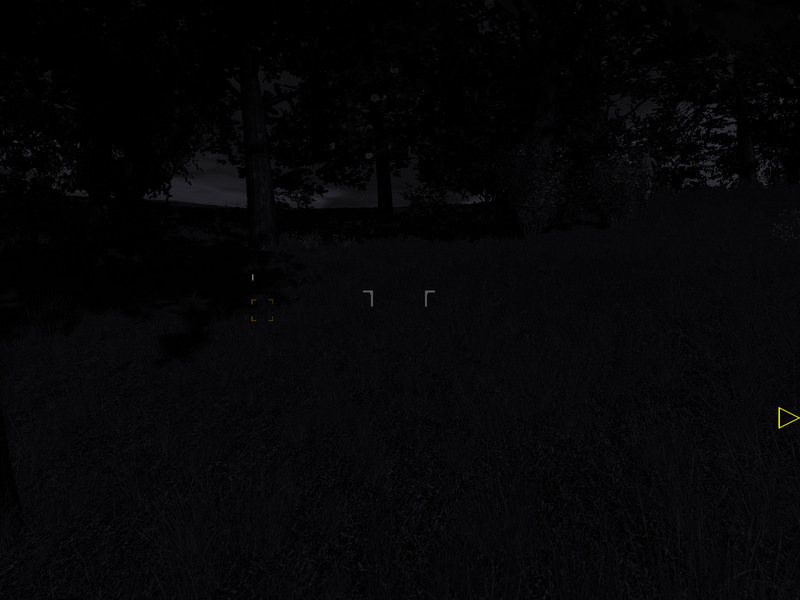 Infantry were assaulting from the northwest as well, and several paras were already in place, firing back at them as they emerged from the shadows. I stood at the entrance to a courtyard, looking across the field to the compound that was now burning. To my left, a para blasted away at the enemy. Something brilliant and green flashed above my head. Tracers! I ducked back against the wall, trying to process where the shots were coming from. The para near me ducked back as well, away from the entrance. More shots snapped and cracked overhead, some of them thumping into the wall beside me, some of them impacting the wall by him. THUNK! A round struck home, dropping the para with a muffled cry of “I’m hit!”. 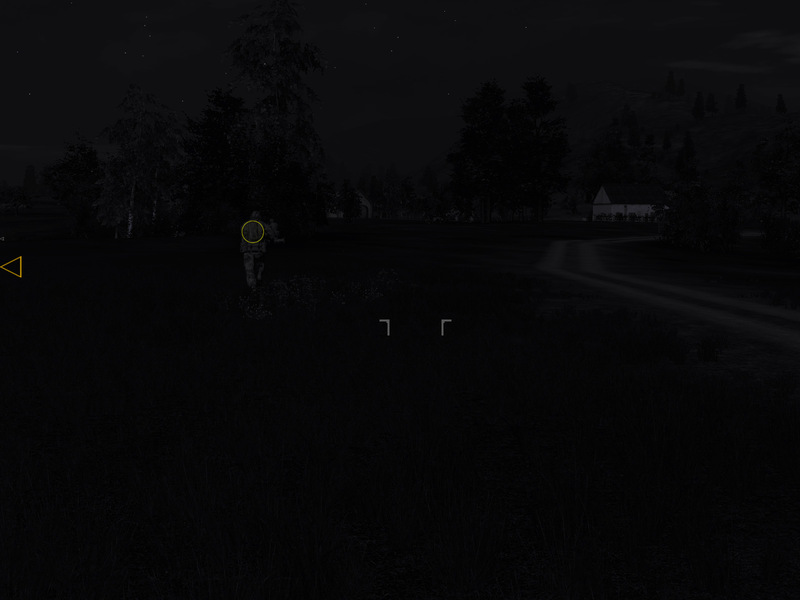 I edged away, turning around to try to locate the shooter. Still, I couldn’t process what had happened – the shots seemed to have come from an impossible angle. As this was going through my mind, Madcows – the leader of the other squad – shouted that he’d been hit as well. He seemed to be on the other side of the wall – I couldn’t exit the compound to take the quick way to him, as it was under observation and fire. Instead, I spun around, ran out the other exit, made it onto the street, and then worked my way up to where he was. Or rather, where I thought he was. As I reached the opposite side of the wall I had seen a para drop at moments earlier, I found that Madcows was conspicuously absent. It slowly dawned on me that he had been the one shot in front of me – feeling like an idiot for missing that, I raced around the corner, taking the short and dangerous route, just in time to find him regaining mobility. In a moment he was tended to, and a moment later he was back on his feet, directing his squad in repelling the enemy assault. 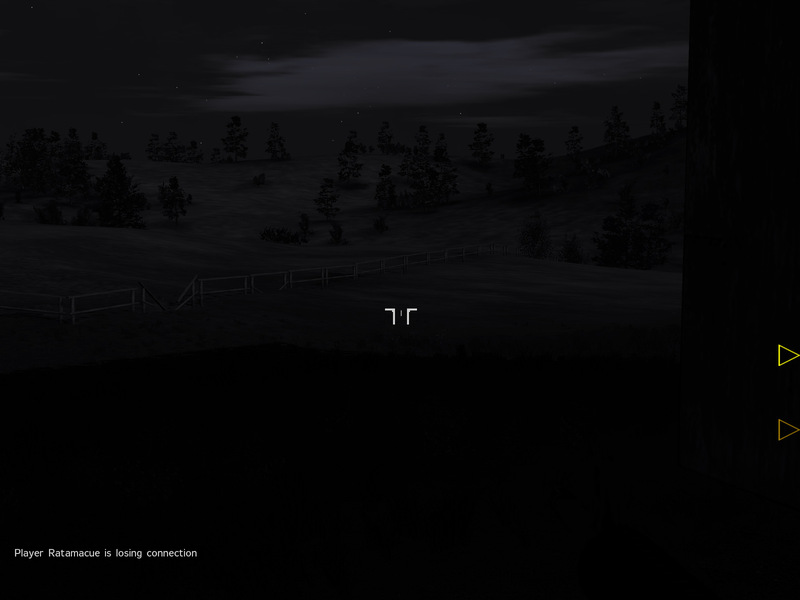 Frags were thrown over the wall in the direction of the enemy, hopefully mopping up anyone who had gotten too close. I made my way back across the street to Joel’s position. During the confusion, Joel had knocked out the approaching T-72 with an RPG scavenged off a dead SLA soldier. He reported that several infantry were still out there, trying to move in from the eastern side of town. 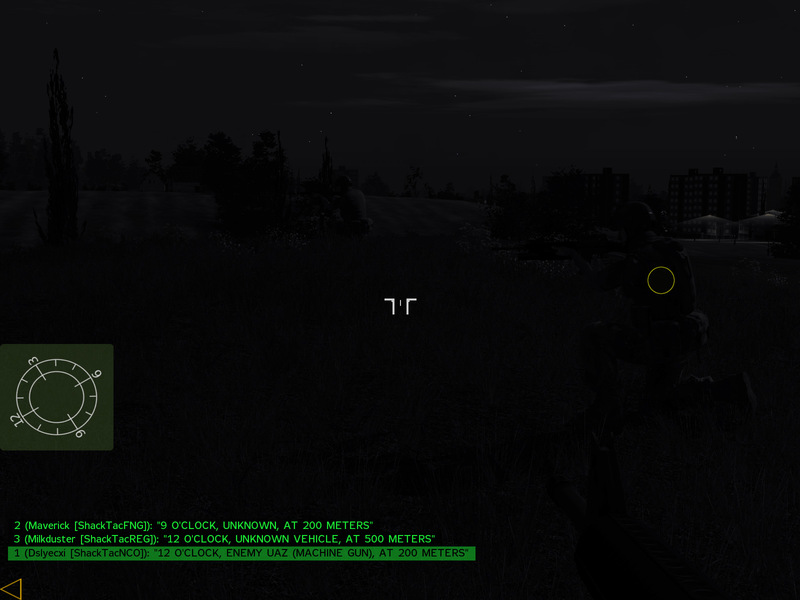 We scanned the area as Madcows’ group continued to engage the enemy on the other side of town. The T-72 sat motionless on the road a mere 70 meters away, just past a merry-go-round sitting in a children’s play area. Two dead black-clad crewmen were sprawled beside it. Further past the tank, on a rise, was a church. Joel had us provide overwatch while he moved up towards the knocked-out tank. White flares were popping frequently enough that we had a fair degree of confidence in being able to see any threats coming before they could engage him. After a few moments Joel signaled for us to join him, and we found ourselves moving out of Modesta to the east – Joel, myself, Lord Warlock, and magila. 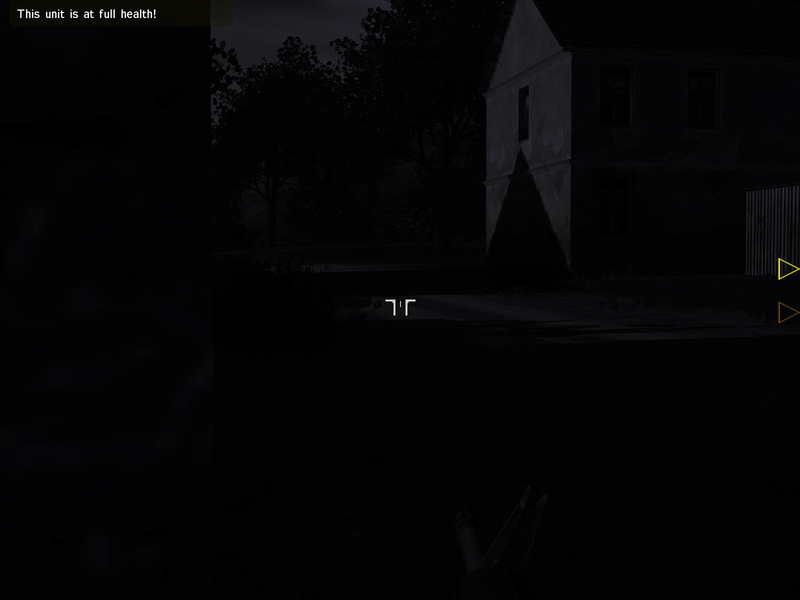 On the way out, a call of “Medic!” gave me pause. I stopped, knelt on the dirt road leading out of Modesta. 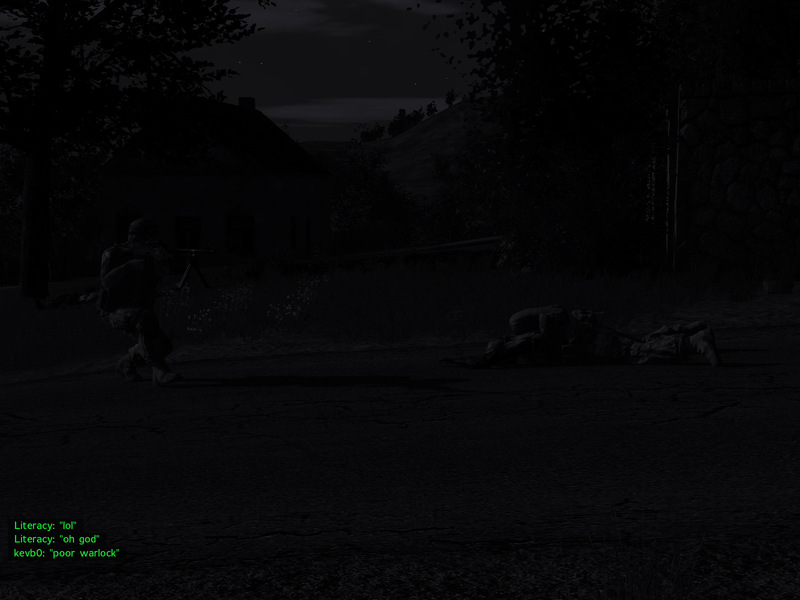 A paratrooper was running towards me – I assumed they were the one that needed help. It was magila – they ran past and I turned to follow. I turned back for one last look at the town as we paused at a structure a bit down the road. 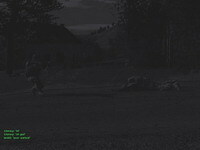 A green flare was in the air, and in the light of it I could see a paratrooper crawling towards us from the edge of town. Whoops! I let Joel know that I had to go back briefly, then booked it down the road to the injured para. It turned out to be Malt, a machinegunner, who had been hit in the legs. As I was patching him up, Hotwire showed up as a runner. “I have a message for you – we have an entire other friendly squad to the west”. I noted this and bid him good luck – he returned the sentiment, and off we went in our respective directions. Little did either of us know that that was the last time we’d see each other alive.  I ran back up the dirt road, once more passing the silent, knocked-out enemy tank. Ahead of me on the path was Malt, and beyond him were the rest of my squadmates. I detoured around a dead SLA soldier on the path and took a knee at our group, clustered together for Joel to pass orders. 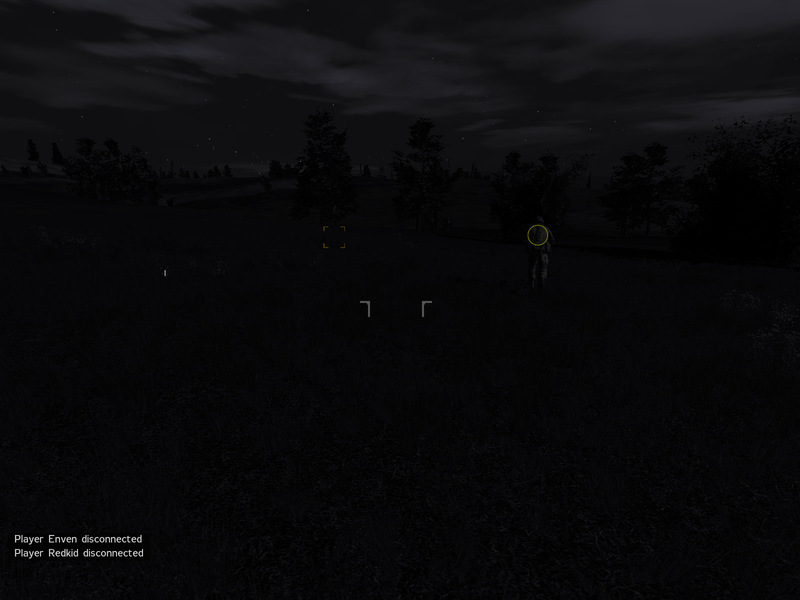 He needed ammo – I gave him a few mags as I passed word about the squad further west. It wasn’t terribly relevant to us at this point, but messengers are sent for a reason, and Joel needed to know. With that done, we set out further east. Joel led us towards the church as our pointman. At this point, unknown to us, we had become the easternmost paratrooper element. There was nothing but SLA forces in the direction we were headed. I saluted Modesta, turned, and followed in trail of our group. We passed through the church courtyard, emerging from it to see a white flare drifting down further east. 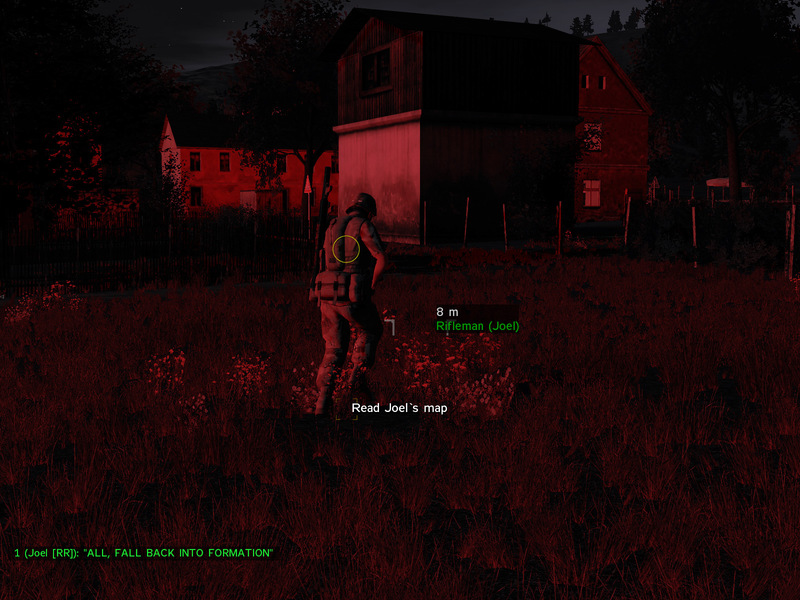 Joel was on point, with the rest of the squad spread out in the darkness around him. Joel spotted enemy ahead, took a knee, alerted us, and opened fire. Others joined in. I did the prudent medical thing – I turned and ran the 20 or so meters back to the church courtyard, taking shelter in behind a broken stone wall. Malt and Warlock ripped into the enemy with their machineguns. Magila blasted away with his rifle. The exchange of fire was furious and fast, and then, suddenly, there was a lull. I strained against the darkness, trying to see any movements in the shadows in front of us. 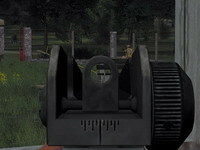 A brilliant muzzle flash exploded in the shadows of the trees, followed by rounds and tracers snapping dangerously close. I hammered the trigger – the firing stopped. Joel, to my front and right, stood up and crept sideways to try to get an angle on the enemy. A flash of green and a burst of fire sent him tumbling to the ground. 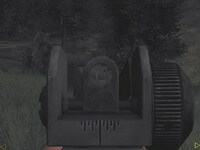 Our machinegunners and rifleman returned fire on the enemy, silencing them, albeit too late. Quiet fell. Trees creaked and groaned in the wind. Somewhere, an owl hooted. I wanted to believe that Joel was only wounded, but he had been hit so fully that there was no doubt he was down. Somewhere far behind us came the cry of a wounded person – they might have well been on another planet by that point. Malt and Warlock scanned the front, machineguns poised. Magila held the left flank with his rifle. There was a tense and ominous atmosphere lurking – Warlock shifted around to try to see what he could see. “EI, left of them!” came a voice from the side. Further still was another voice – “Danger close!”. It was Magila and Malt. Rifles cracked, machineguns blazed. The immediate enemy fell dead. Behind them, an SLA soldier fired a white flare into the sky. 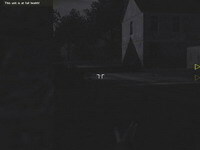 I had moved back to the cover of the church courtyard and was urging the rest of the squad to do the same when the flare burst. The flare exposed a few SLA crawling along a road to our front. I snapped shots at them from cover as teammates moved back to the relative safety of the stone. A grenade exploded, sending one SLA trooper tumbling. Down to my last magazine, I fell behind cover to let the remainder of the squad deal with the stragglers. 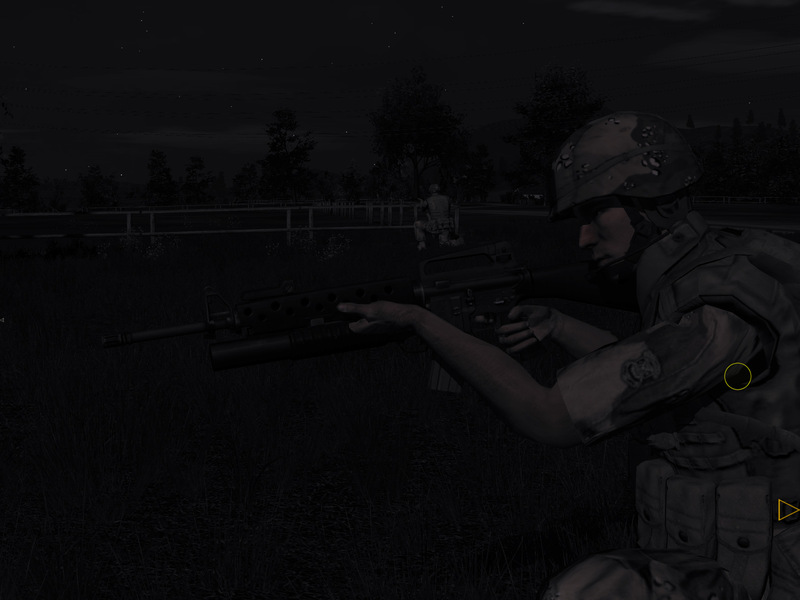 Or at least that was my plan for a few moments – the tension of being stranded out in the darkness had me back at a firing position after a few moments. Two shots were fired into the shadows at a suspected enemy – nothing. A few moments later I caught sight of something else moving in the shadows and laid into it – return fire proved my suspicion to be true, and the SLA soldier presumably fell dead from the volley. With Joel dead, we were without a map. When you’re knee-deep in enemy territory, that’s not going to do you any favors in the scheme of survival. To remedy this, magila made two runs out to Joel’s body – one, to get his ammo, and two, to retrieve his map. We covered him as he went, and with a bit of luck he made it back to us safely. I ended up with the map and took command of the remainder of our group. We sat in the courtyard for a bit as a plan was hatched. Several probing attacks by the enemy were repelled with no losses. 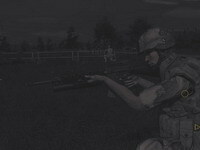 Eventually I decided that we would make a movement towards the Bravo drop zone marker a few hundred yards to our northeast, with the intent of scavenging weapons and then falling back to Modesta to link up with another squad. Based on the ferocity of contact we had encountered, it seemed futile to try to make our way further east as only a fireteam. 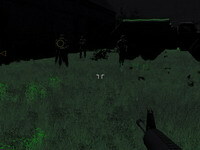 We headed out in a column formation, sneaking our way towards the location where the weapon bundle was expected. The flarelight that had given us a sense of security previously was now absent, save for the occasional pale flickering light of a distant. A brief exchange of fire was made shortly after leaving the compound – a straggler from the group attacking us earlier, poised in the shadows, waiting for us to leave the courtyard. We reacted quickly and took him down before his rounds could find us. 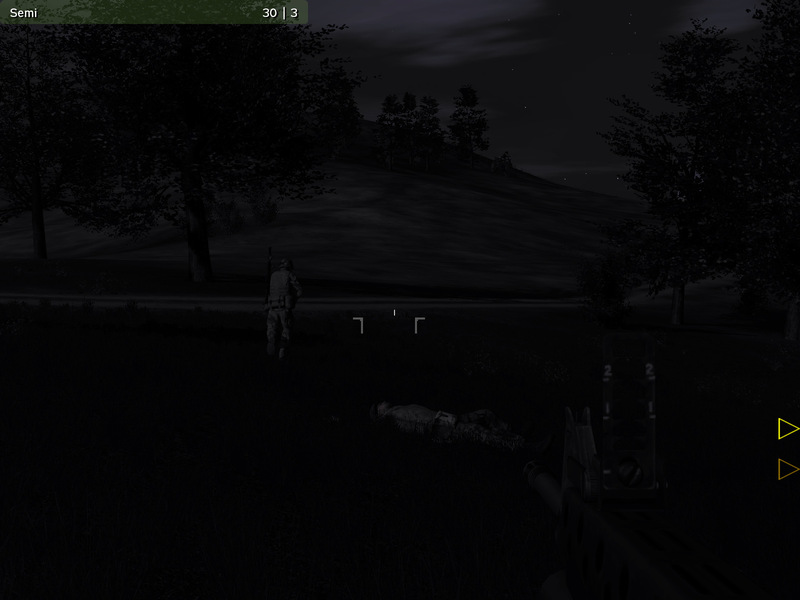 Our path took us near Joel’s body – I knelt at it, grabbed his M16 with M203, and took a few flares for good measure. They would likely prove critical to linking up with any other paratrooper elements. We made it the rest of the way to the weapon bundle without incident. It had landed on a hillside – unfortunately, there was nothing of any real value inside. We all took a moment to grab a few spare mags and flares. I looked to the east, further into enemy territory. There was nothing to see – the darkness shrouded the next village over. With only four of us left, I didn’t think we would have a chance at moving further in that direction. So, instead, I started us on the path back towards Modesta. For a moment we moved out slowly. Then, without a word, our pace quickened. 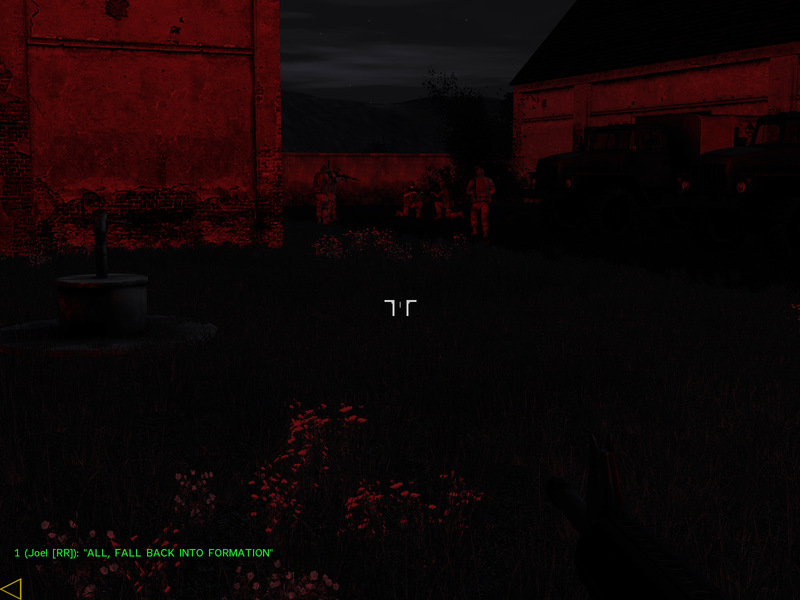 The darkness held untold numbers of SLA soldiers, and we were but four paratroopers. We jogged down the hill, eyes peeled for any hint of the enemy. 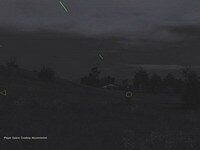 To the northwest a flare popped, distant – Frenchie or Madcows’ squad, more than likely. It was a welcome bit of illumination as we fell back towards the church we had holed up in minutes earlier. We ran in silence, passing the church for the sake of expediency. The flares died away and once more we were shadows slipping through an eerie moonlit expanse. A burst of gunfire erupted to my front left, seemingly out of thin air. It was unbelievably close – all I could do was sprint forward towards a nearby tree and hope it wasn’t aimed at me. 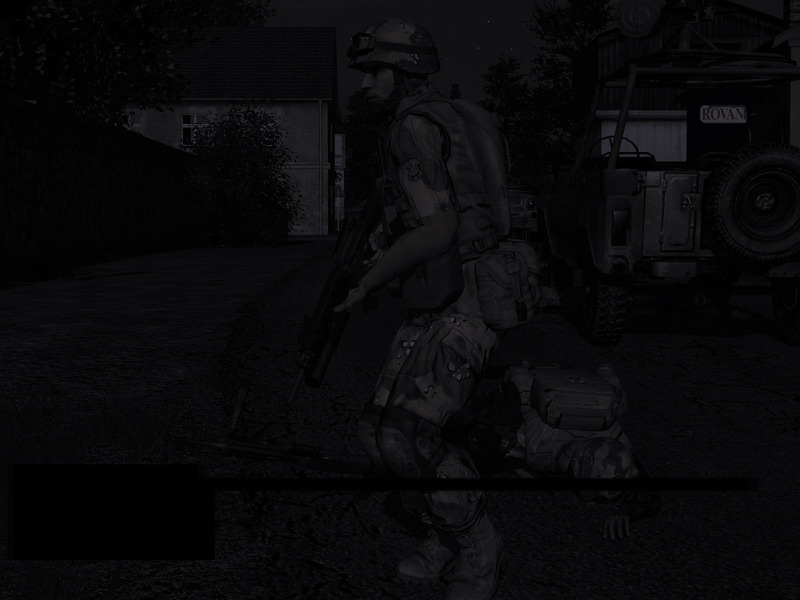 The muzzle flashes of an AK-74 illuminated an SLA soldier, standing tall, unloading on someone. 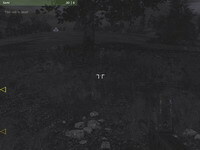 I hit the tree, came around it, weapon rising all too slowly. 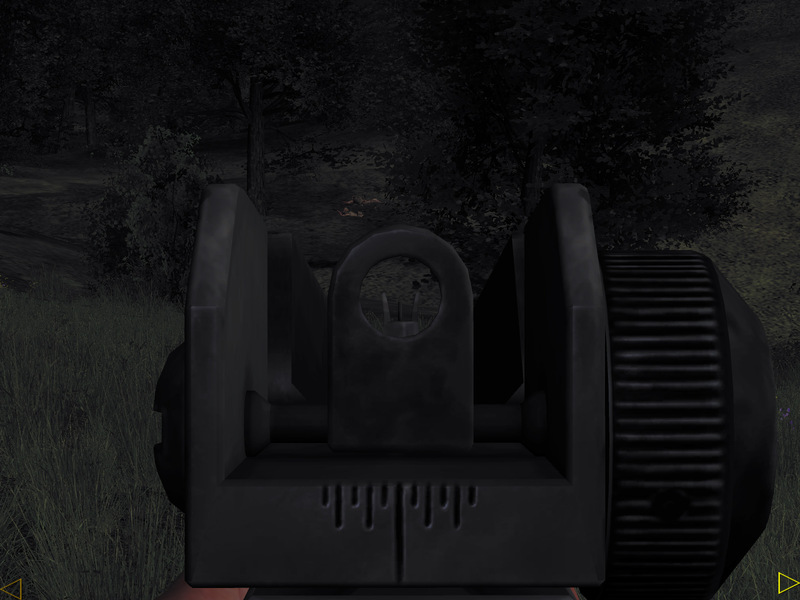 A machinegun started barking behind me, and I found myself firing before I had even shouldered my own rifle. The bullets thumped into the ground, edging closer to the enemy figure with each new round, until finally they connected. The better part of a magazine was spent to insure that the ambushing soldier was indeed dead. It was difficult to see what the aftermath was in the darkness. For a moment we seemed ok – somehow, the SLA must have missed us. Sure enough, a familiar form lay crumpled beside a tree. There was nothing to do for him – the enemy’s burst must have caught him in full, as he was quite clearly gone. We took his map, reflected on the loss for a moment, and moved out. It was another body in what was becoming a sad and broken trail. The urgency of linking up with another group of paras was becoming more pressing with each loss. We moved on. A flare went up somewhere in the distance – the illumination, timed a minute earlier, could have revealed the SLA who took down Malt. Timed as it was, however, it did little for us – the area, as far as we could see, was clear. Our pace had slowed after the ambush. We crept steadily on until only a hundred meters away from the edge of town. 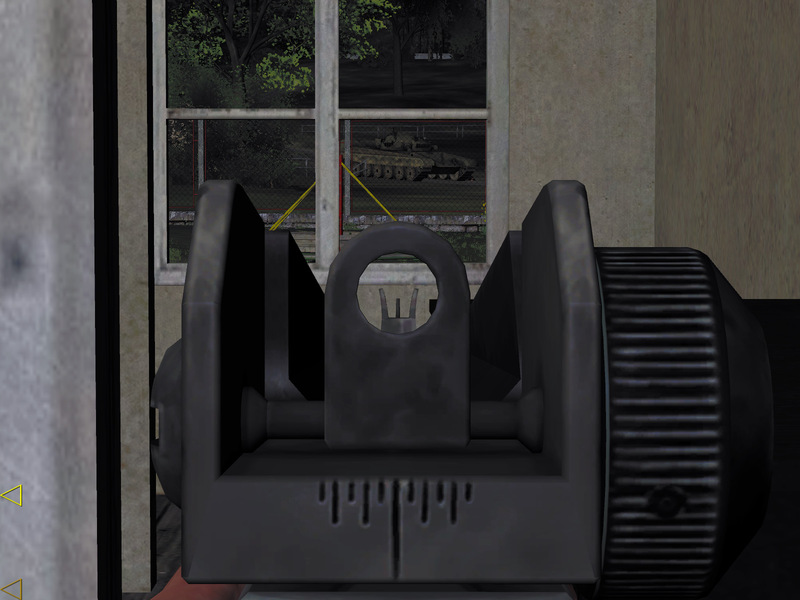 The air was suddenly full of machinegun bullets snapping and snarling past in short bursts from our left. Warlock and magila hit the deck and returned fire. I was ahead, out of the immediate kill zone. One enemy, lit by his muzzle flashes, was dropped by our combined fire. Green tracers zipped towards the two machinegunners. I took cover behind a tree and popped a flare, and as quickly as it had started, it was over. Warlock jumped to his feet and ran towards me, followed by… nothing. Magila was dead, shot in the exchange. We had moved quickly and lost a man. We had moved cautiously and lost a man. It seemed that whatever we did, we were going to take fire, and the smaller we became, the more likely the next exchange was going to get me. This time I opted for speed. Warlock and I sprinted towards Modesta, past the knocked-out tank, into the village proper. The streets were dark and empty, with not a soul around. We darted down one, turned, headed to the western edge of town. 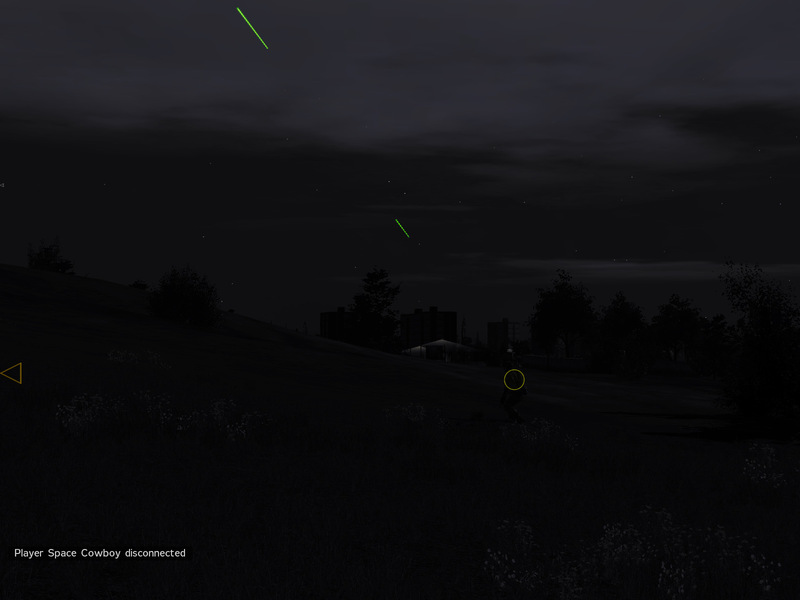 The two UAZs that had been shot up earlier sat there silently, dead SLA strewn around them, flies buzzing busily about. Further west some sort of vehicle engine could be heard. A look at my map confirmed things – we had only one real option at this point, and that would be to move north by north-west and attempt to link up with Frenchie or Madcows’ squads. The T-junction they had likely moved to was only 700 meters away, over a few small hills. It seemed like we could manage that, and then we’d be working with a unit strength that could deal some serious damage to the SLA. “From here we’re moving north-west, we’re trying to reach that t-junction”. The plan was simple enough, and Warlock looked ready to roll. I turned back to the way we were going to head, eyes drawn momentarily to the partial moon floating above the horizon to the west. It was quiet aside from the buzz of flies and the sounds of the night. 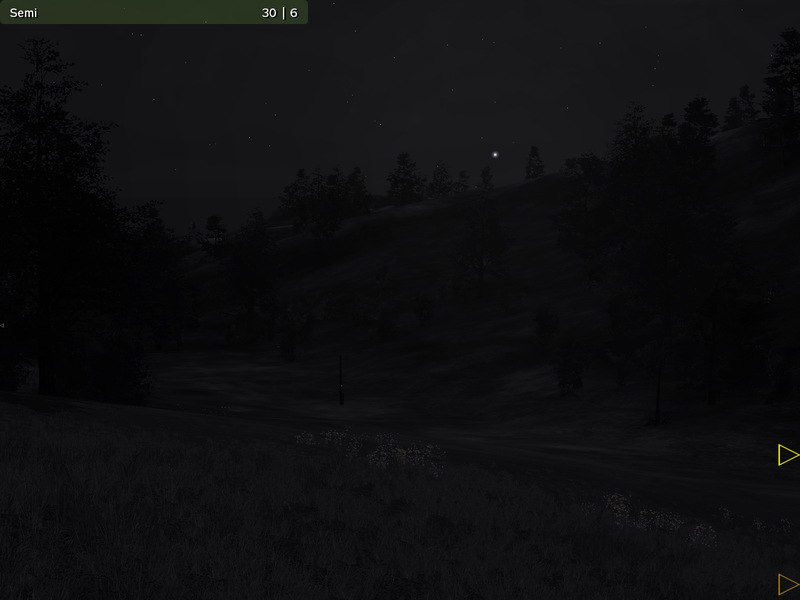 The pale moonlit landscape seemed desolate.